I want to believe that a fraudulent webpage hosted online is not positive advertisement, as far as a media company and a Nigerian webhosting company are concerned. 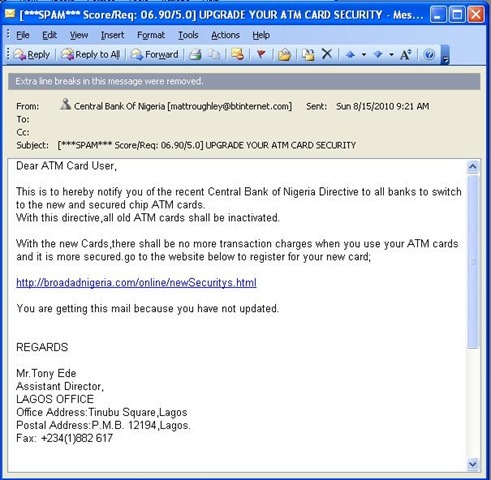 This is to hereby notify you of the recent Central Bank of Nigeria Directive to all banks to switch to the new and secured chip ATM cards. With this directive,all old ATM cards shall be inactivated. You are getting this mail because you have not updated. The media company Name is: Broad-Ad Audio Visual Production Services. 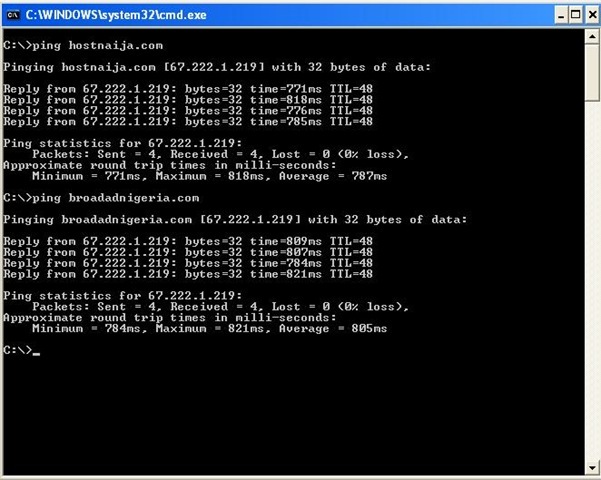 Heres a ping response from domain name: broadadnigeria.com and hostnaija.com. Both are on the same server. THe question I have is: who is scamming who? 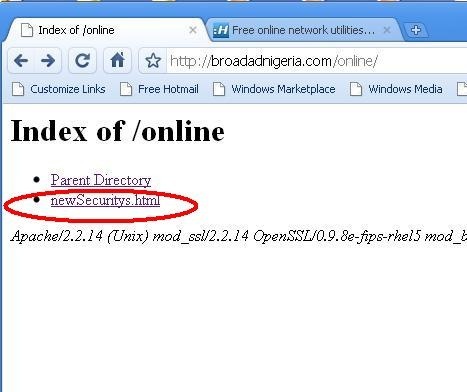 Is Mr. Kevin Ushi responsible for placing a newsSecurity.html page in the /online DIR of his own website, or are the servers of hostnaija.com compromised such that /online/newSecuritys.html is created by default. Nigerian web hosts have really got to stop looking @ making fast money and start monitoring what sites are hosted on their servers. 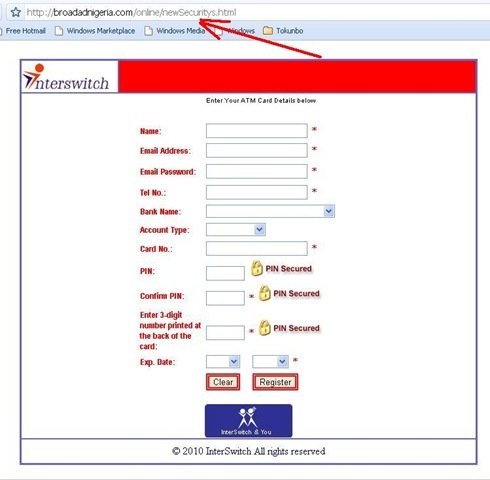 This is the reason why some Nigerian Hosting Companies are now insisting that anyone that desire to buy a domain or hosting package from them must present a photo ID. If HOSTNAIJA has done that, they will be able to absolve themselves of any blame on this particular issue. 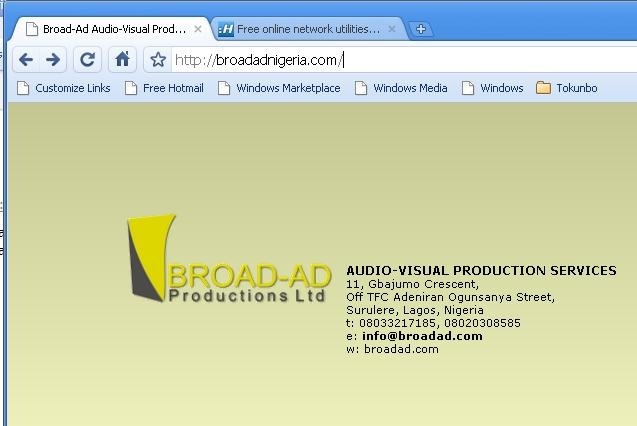 This is to inform the General Public and security agents that Broadadnigeria.com is not aware of this misleading allegation posted in this blog..
Broad-Ad Audio-Visual Productions run legitimated businesses and NEVER engages in ANY fraudulent activity. We hereby state that our company is duly registered with CAC and that we do not know nor have any dealings whatsoever with any individual or company that distributes fraudulent information and we DO NOT HAVE ANY FRAUDULENT CONTENT OR MATERIAL NOR HOST ANY INTERSWITCH WEBSITE on servers. GENERAL PUBLIC: Kindly disregard any further missive from this source or report to the appropriate security authority. BLOG OWNER: PLEASE, KINDLY REMOVE THIS MISLEADING POST IMMEDIATELY. it would be better if you get across to your domains administrator so that he can take necessary technical precautions against such an occurence whereby there is a URL within your hosting account that you guys didn’t put there /aren’t aware of.